She is shocked and cannot understand why her husband is taken, for how long, what they would do to him and what she is supposed to do. This is a recent picture of Mrs. Nakhaii ; the 88 years old wife of Mr. Muhammad Hosain Nakhaii from the village of Khoosf. She is advanced in years and suffering from dementia. The neighbors, friends and family are shocked also and doing all they can to hold and console her and find out the where about of her husband. On May 14, 2012 the Islamic Republic Regime’s authorities raided their home and without presenting any warrant searched the house, confiscated family albums, Baha’i books and arrested Mr. Muhammad Hossain Nakhaii. This was specially traumatic for Mrs. Nakhaii since her husband had been arrested some years ago and spent 5 years in prison on the charge of being a Baha’i and teaching his religion. The imprisonment of the sole breadwinner in the family was very hard and painful for Mrs. Nakhaii and their four daughters in a country where he was not only the breadwinner but the protector of his wife and children. Mrs. Nakhaii knows, respects and believes in the divine reality of Islam as one of the world religions, as all Baha’is do. She has many family members and friends who are Muslims and have great love and respect for each other. Love and humanity must be born out of real faith, they all believe. She is deeply sad, however, about what is done in the name of prophet Muhammad. As a Baha’i she believes all the messengers of God have come to teach us to be loving and kind and that life is an opportunity to show our humanity to all. She really cannot understand how anyone, in the name of Islam, which is the religion of submission to the Will of God, and God being all loving, all merciful, all compassionate, can commit such inhumanity and arrest her old and loving husband. Her heart is bleeding with sorrow and her tears cannot stop running down her beautiful and wrinkled face. She asked people to find out where they took her wonderful husband, life companion and friend. “They came and took him like a criminal and did not tell me where they took him.” she cried and wept. The neighbors, family and friends began a search and finally they were told that Mr. Muhammad Hossain Nakhaii is taken to the Prison of Muhammadieh in Birjand!! Why, she wants to know? What has he done? Every one in the village agrees that Mr. Nakhaii is such a loved and respected person. Everyone has been the beneficiary of his kindness and good will. People cannot understand how in the name of Islam their peaceful village has been attacked and violated. “Who would do such a thing in the name of God” neighbors ask. Really this is what Islam is all about? What happened to the teachings of the Prophet Muhammad that all human beings are of one stalk and God created everyone. The happy village of Khoosf is no longer happy. Many people are sad, confused and angered. Some have started to question who amongst them has betrayed their moral values of humanity and fear of God perhaps for some favors and gains. “Perhaps, the person who reported Mr. Nakhaii to the authorities, was afraid and scared like the Germans who were afraid, sided with the Gestapo and looked around to find a scape goat at the time of Hitler”, one suggests!! “But we all have known Mr. Nakhaii and it has been no secret that he is and has been a Baha’i all the years in our village and a most wonderful God loving neighbor at the same time.” a neighbor acknowledges. ‘The Islam we know and believe in has taught us to respect every one’s right to their beliefs and religion.” a young man who looks outraged explains. “We say, Isa be deene khod, Moosa bedine Khod, (Jesus is free to have His religion and Moses is free to preach His)”; the neighbors exclaim. But you can tell some thing has changed in the village; fear and suspicion is in the air. No longer people are trusting each other. The air in the village is heavy and the market is sad. People do not want to look into each others eyes any more. Conversation is limited to shop talk small talk, just to be safe. Nobody knows who is spying amongst them. 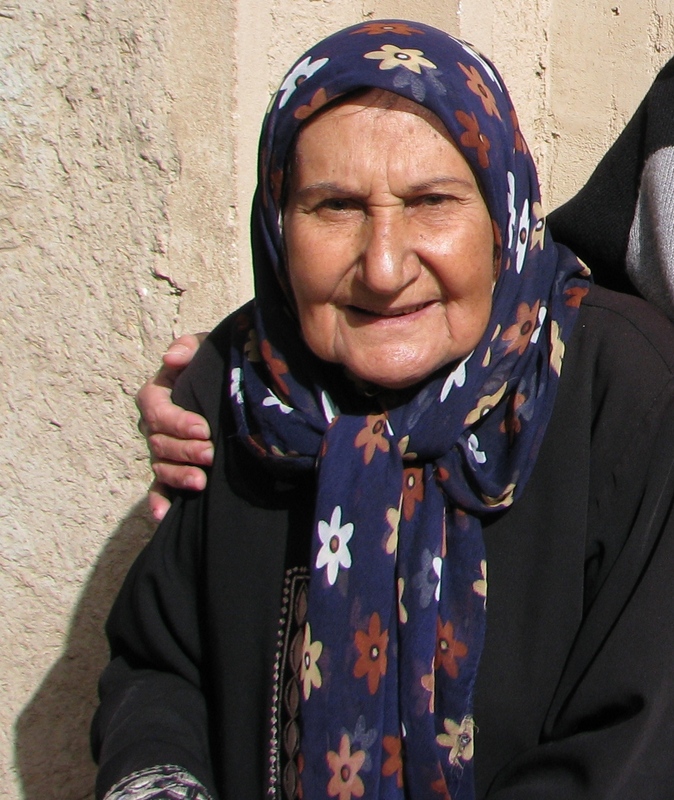 Mrs. Nakhaii has 4 adult daughters and has lived in the Village of Khoosf in the State of Khorasan, near the city of Birjand in Iran. 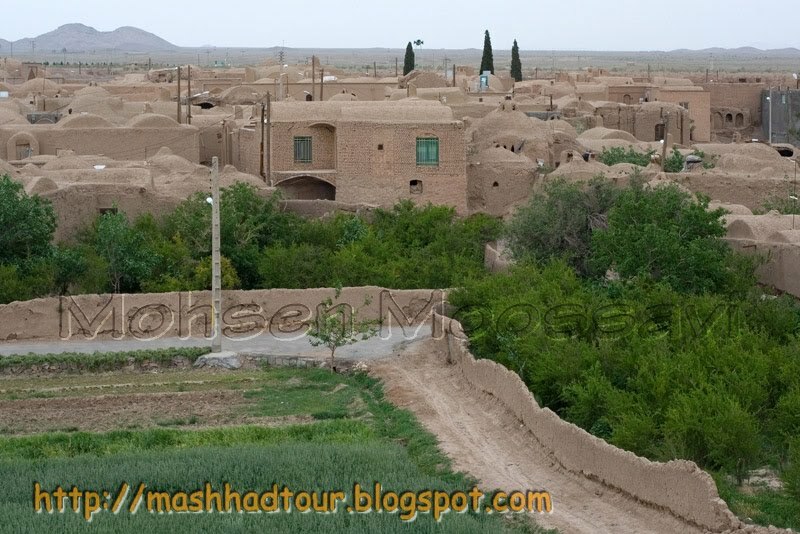 Life in the remote village of Khoosf where every one feels like an extended family has been peaceful until the night where out of no where the Islamic Republic Regime’s authorities raided their house, arrested her 85 year old husband and searched her house taking all her family pictures and Baha’i books!! Finally they found out his where abouts. He is held as a political prisoner in the city of Birjand in the prison of Muhammadieh. The judge refused to give Mrs. Nakhaii the right to visit her husband declaring him accused of a too serious of a crime to have the right of visitation until his trial. They asked when is the date of the trial and the judge angrily refused them an answer saying; ” The trial will be when it will be”, sending away the poor and old woman in suspense and in tears! There must be more than one God in the mind and heart of humanity no mater what the messengers of God has told us. We know by the fruits that there is a loving, compassionate, merciful, patient, just, forgiving, God. The people who believe in this God reflect and radiate His attributes. And there is also a God who is cruel, vengeful, petty, divisive, source of sorrow and darkness and some people believe in this God of division and destruction and reflect its Dart Wader attributes. No one is immune. We all participate in this drama of letting Dart Waders take over our towns and villages or a role our sleeves and be the Luke Sky Walkers of our communities for now and posterity. Keep safe all the innocent. protect Mr. and Mrs. Nakhaii, all the Baha’is of Iran who are standing firm in support of light and love no matter what blows they are struck with. Pray that love, mercy and integrity persevere amongst all humanity. Ask why when we see injustice. Pray for the judge who to have eyes to see the truth and ears to hear the cry of the wronged. Teach our children about “Never Again” and what it means to stand up for the human rights of all humanity. Let us do all we can so no one can get away with violations of basic human rights on our watch. محمدحسین نخعی در سال 1306 هجری شمسی در روستای کوچکی ازتوابع شهرستان بیرجند متولد شد. نام این روستا خوسف ودر قلب کویر در شرق ایران واقع گردیده است .وی در سن 28 سالگی با خانم فرخ لقا رفیعی ازدواج کرد که ثمره ی این ازدواج چهار فرزند دختر میباشد.وی بعد از تولد چهارمین فرزندش به شهرستان گنبد واقع دراستان مازندران نقل مکان کرد و در آنجا به شغل کشاورزی مشغول گردید. در طی این دوران همواره به خدمتگزاری مردم مشغول بود و هرکس آشنایی مختصری با ایشان داشت به بزرگواری و خیرخواهی وی شهادت می داد.سپس در سال 1360 هجری شمسی به شهر کوچکی درنزدیکی گنبد (بنام آزادشهر) مهاجرت کرد و علاوه بر گذران زندگی و آشنا نمودن مردم آن نواحی با تعالیم بهایی در فعالیتهای اداری جامعه بهایی آزادشهر شرکت فعال داشت که نتیجه آن دستگیری ایشان به جرم اعتقاد به دیانت بهایی بود اتهامی که به سادگی و تنها با اعلام دوری جستن از اعتقادات قلبی به دیانت بهایی قابل رفع شدن بود. برای ایشان 5 سال محکومیت به زندان را درپی داشت. این پنج سال زندان دوران بسیار سختی برای وی و خانواده اش بود.نان آور خانواده محکوم به گذراندن زندگی خود در زندان شده بود و بار اقتصادی خانواده به دوش فرزندان افتاده بودکه در جستجوی کار به طهران نقل مکان کردند و مادر خانواده به تنهایی در آزادشهر و در نزدیکی همسر خود به زندگی ادامه داد که سختی مضاعف را به سبب تنهایی متحمل می شد. بالاخره دوران 5ساله زندان سپری و ایشان پس از آزادی از زندان به همراه همسر خود به طهران و نزد فرزندان نقل مکان کردند. در سالهای بعدی 3دختر ایشان ازدواج کرده و هر یک خانواده ی مستقل تشکیل دادند. این فرصت مناسبی بود که ایشان بهمراه همسر به زادگاه خود مراجعت نموده و درخانه اجدادی خود که قدمتی بیش از 150 سال دارد ساکن شود. اقای نخعی وهمسرشان نزد همشهریان خود بسیار محبوب و مورد علاقه مردم بودند هرگاه فرصتی دست میداد ازهرنوع کمک ویاری به مردم کوتاهی نمی کرد هرچند که هرازگاهی مورد آزار و تهدید متعصبین و عوامل حکومتی قرار میگرفت. در آخرین اقدام عوامل حکومت روز یکشنبه 14/5/2012مــاموران امنیتی وزارت اطلاعات بدون در دست داشتن حکم اقدام به ورود غیرقانونی به منزل ایشان نمودند و خانه را تفتیش نموده کتب بهایی آلبوم های عکس را به همراه خود برده و دستور دادندکه ایشان خود را به اداره اطلاعات معرفی نماید که پس از مراجعه ایشان به اداره اطلاعات ماموران اقدام به بازداشت وی کرده وپس از یکهفته بازجویی به زندان محمدیه بیرجند منتقل کرده اند بستگان ایشان برای تعیین وکیل به چند نفر از وکلای بیرجند مراجعه نموداند که هیچ وکیلی از ترس جان و موقعیت خود حاضر به پذیرش وکالت این پیرمرد 85 ساله نشده است.همه اینها در حالی است که چهار فرزند ایشان در خارج از کشور ساکنند و همسر 88ساله وی با مشکلات جدی از لحاظ سلامتی مواجه است و تنها تکیه گاهش همسر زندانی شان آقای محمدحسین نخعی میباشد. This entry was posted in Farsi, human rights, Questions and tagged human rights violations of Baha'is of Iran, Mr. Muhammad Hossain Nakhaii, Mrs. Nakhaii, no date of trial, picture of Mrs. Nakhaii, recent arrest of the old baha'i farmer, village of Khoosf.. Bookmark the permalink.